Self managed superannuation funds (SMSFs) are private superannuation funds that are managed and controlled by the members. These funds are sometimes referred to as ‘DIY funds’ (although very few members of such funds find that they can indeed ‘do it themselves!’). There may be up to 4 members in the fund; and contributions can be made to the fund by members and/ or their employers. There are many benefits to starting an SMSF: there are also onerous responsibilities to undertake in being part of the administration and management one of such a fund – and prospective members should understand those responsibilities before becoming involved. Why do people set up a self managed superannuation funds? The members have control over the fund, including making investment decisions within the fund. This allows members and their financial adviser to tailor an investment strategy that suits individual circumstances and risk profile of the members within the constraints of the SIS legislation and regulations. 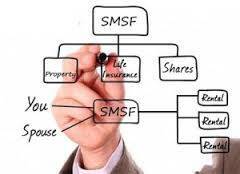 Having an SMSF gives members a wide range of investment options, such as direct shares and direct property, including property used by their business. In restricted circumstances, the fund can purchase assets from members of the fund. In many cases, particularly for larger amounts of money, a self-managed super fund can be operated at a lower cost than would investing in retail super funds. An SMSF can be an effective estate planning tool. For example, a property held in the fund that the members wish to keep and pass on to other family members: by using a SMSF, the property does not necessarily have to be sold if a member dies; instead, it can be used to pay a pension, or it can be paid out as a lump sum payment in settlement of a death benefit. What are some of the ‘onerous obligations’ taken on by a member of an SMSF? Members of a self managed superannuation funds are also required to be trustees of the fund (or a director, if a corporate trustee is used). On establishing a SMSF, it is the responsibility of the trustee(s) of the fund to ensure that the fund complies with the law at all times. It is therefore important that trustees at least, understand their administration and reporting obligations – and seek professional help if necessary. Ensuring that the fund at all times complies with the relevant legislation. There are severe penalties for trustees who fail to ensure that a super fund is properly administered. Therefore, it is advisable that, where necessary, you obtain the services of professionals who can assist you in ensuring the compliance of the fund. What are some restrictions on the use of a SMSF? A SMSF must be maintained ultimately to provide benefits to its members on retirement or death. It cannot be used as a means to gain a benefit before retirement. Invest more than 5 per cent of its assets in a private company or trust controlled by a member. This means that you can not transfer your residential investment property into a SMSF. Your SMSF can however purchase an investment property from the open market, but you would not be allowed to rent it to yourself or a family member. Where can you get advice about setting up a SMSF? ‘we listen, we understand; and we have solutions’ – that we deliver in personalised, professional wealth management advice that you can understand. To arrange a meeting with one of our team, call our office on 07-34213456; or use the Contact Us website facility. We look forward to being of service to you. Self-managed super funds (SMSFs) provide a way of saving for your retirement. The difference between an SMSF and other types of fund is that the members of an SMSF are usually also the trustees. Thanks for the comment Jerich: whilst it states a fairly obvious matter for Australians seeking to provide for a self-funded retirement, it is also wise for them to reflect on the onerous duties and responsibilites that they take on when acting as trustee of such a fund. Even with the guidance and assistance of an efficient administration provider behind them, they have the ultimate responsibility: and they have that jointly and severally. To fulfil the obligations as a trustee, we certainly recommend using a financial planner to ensure that the fund’s Investment Strategy is properly formulated (including the requisite consideration of insurance on members); and an administration provider to ensure all compliance documentation is completed and properly filed with the regulator.